With natural obstacles like downed trees, creeks, low-hanging branches and more, each runner must give his/her all to complete the course. Trail runs are for those who want a physically challenging run and an experience they will not soon forget. 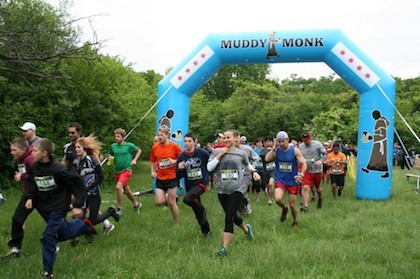 To help promote their events, Muddy Monk hired Landmark Creations to build a custom inflatable archway. Branded with the monk logo, and sporting an easily seen bright blue color, the arch has become an iconic symbol of the races. "We usually have to keep the arch up for at least 30 minutes after our races since so many people want to get their photos taken with it!" says Art Boulet, Founder and CEO. "It just added to the fun that people already have at our races." All those photos have to end up somewhere, right? We're guessing they resulted in a ton of tweets, Facebook posts, pins and pluses… all of which bring in bunches of additional (free) exposure. Just one more benefit of using branded inflatables in your marketing. Searching for an inflatable archway that will wow participants? Browse our online gallery of arches!